Hello everyone. It's been awhile since my last post as it has been an eventful 10 days having played across Western Canada with an exciting eleven piece band, performing all the music and arrangements from the seminal album "Art Pepper+11". Overall our small tour was a resounding success. I'd like to thank Dean McNeill for going above and beyond the call of duty in organizing this tour as it was no small feat at all. We drove many kilometers, shared many laughs and played some great music. Fortunately our show was recorded by the CBC during our performance in Saskatoon at the University of Saskatchewan so we'll be able to share some of this music with the rest of the world in the coming months. "I think that everyone should study drums as time and rhythm are the most important things in playing. As you told me once, "It is Harmony and Melody that have fucked up music" I really took that to heart and I try to play with as little melody and harmony as possible now. I have even stripped down my tenor so it only plays 5 notes now." -I spent much of my time over the past ten days driving across Alberta/Saskatchewan/Manitoba in the company of saxophonist's Jim Brenan, Bill Prouten and Greg Gatien. So we listened to ALOT of Michael Brecker, Ralph Bowen, a good fill of early Duke Ellington (from the Blanton/Webster band era courtesy of Bill) and a nice dose of 70's funk. I also learned alot about tenor mouthpieces, ligatures and saxophone vibrato. I love hanging out with musicians that like to talk shop! -Finally, a few people I'd like to thank for their music and for being overall really nice human beings: Dean McNeill, Dave Morgan, Brad Shigeta, Jeff Preslaff, Carsten Rubeling, Greg Gatien, Jim Brenan, Bill Prouten, Will Bonness, John Hyde, Jim Head, CBC Radio, the University of Saskatchewan, Brandon University, the Yardbird Suite, the Beatniq Jazz & Social Club, the University of Regina, Campbell Collegiate, Mr. & Mrs. McNeill, Kevin Marsh, Jennifer McAllister, Nick Fanner, Kathy Anderson, Brent Ghiglione, Mayfair United Church, the McNeill's in Sherwood Park and Roy Sydiaha. 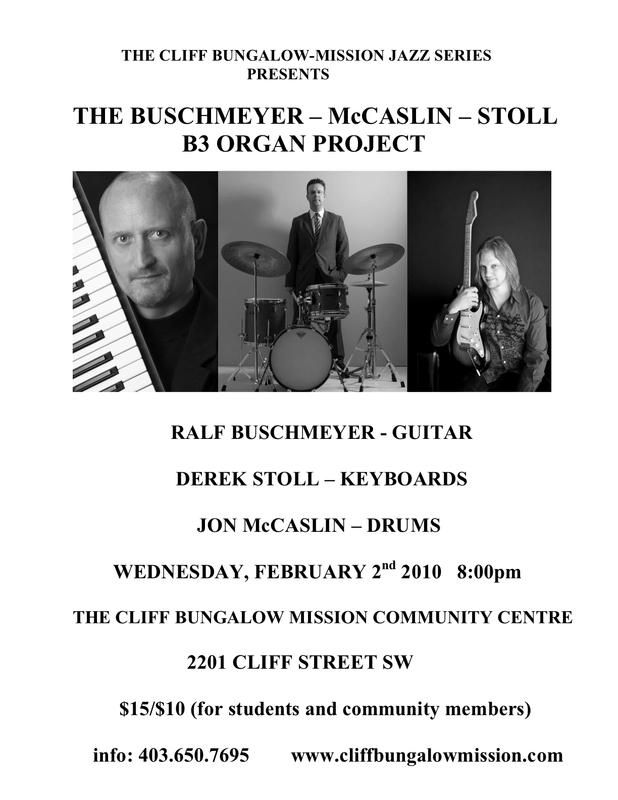 The Buschmeyer-McCaslin-Stoll B3 Organ Project is the latest collaboration between Calgary jazz artists Ralf Buschmeyer on guitar, Derek Stoll on keyboards and Jon McCaslin on drums. Evoking the sounds of the classic jazz organ trios of the 1960s, these artists have come together to present an evening of grooving and hard swinging music inspired by such artists as Wes Montgomery, Grant Green, George Benson, Stanley Turrentine, Jimmy Smith and Larry Young. The groups repertoire will focus on classic jazz standards and compositions drawn from the classic jazz organ trio era. After an exciting start the CBM Jazz concert series is now in its second season. Organized by local jazz enthusiast, saxophonist and composer Jan Mulder, the monthly series of concerts features some of Calgary's best jazz musicians and ensembles and provides an ideal opportunity to spend a relaxing evening. The concerts are conducted in the quiet listening and family friendly environment of the Cliff Bungalow-Mission community hall and take place on the first wednesday of every month. Each 2 hour performance starts at 8 pm so everybody can get a good night sleep and be rested the next morning. Coffee, tea, and beverages are served. There is a $15 cover fee for each event ($10 for community association members and students). Tickets are sold at the door. Call 403-650-7695 for more info. I'm headed on a tour of Alberta, Saskatchewan and Manitoba imminently with trumpeter/composer/swell guy Dean McNeill and an ensemble consisting of many of Western Canada's finest Jazz artists. 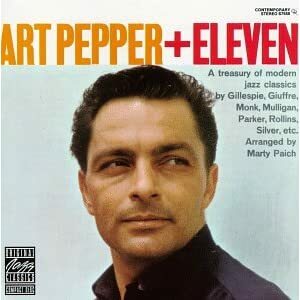 We'll be performing music from the seminal album "Art Pepper+11" and newly commissioned compositions and arrangements written by members of the band specifically for this tour. Come by and say hello if you're in the neighborhood! Hey, I'm co-hosting the jam session at the Beatniq Jazz & Social Club tomorrow evening starting at 9:00pm with guitarist Ralf Buschmeyer and bassist Wes Caswell. 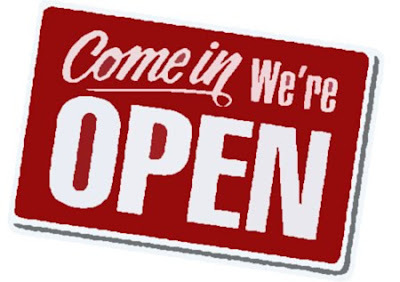 Come on by, sit in for a few tunes and say hello ! Ralf is one of Western Canada's guitar greats and a consummate musician. His influences range from Grant Green & Wes Montgomery to Lorne Lofsky, Ed Bickert, Mike Stern, Pat Metheny and John Scofield. Ralf can swing hard and then rock out when it counts. It's always a pleasure to play with Ralf and it will be for sure a fun night of music ahead of us tomorrow evening. Don't miss it! I think the first album with Al Foster that really got my attention was Joe Henderson's "The State of The Tenor" (a great live trio date with Ron Carter on bass recorded at the Village Vanguard). I've been playing a lot of Joe Henderson tunes with Jim Brenan lately, so this one has been getting a lot of airplay around my house these days. Blue Mitchell's "The Thing To Do" is also a great one featuring a very young "Aloysius" Foster on drums (dig his funky calypso beat on "Fungii Mama") and definitely required listening if you ever hope to have a conversation about Jazz with Kevin Dean ! -As drummers, our most important ally on the bandstand is the bass player. 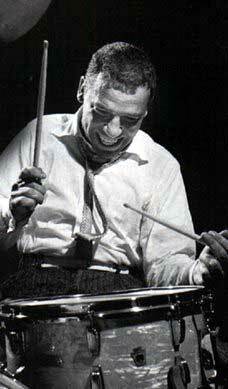 It's also hard to think of how hard a great drummer swings without thinking of the bass player they are playing with! The two go hand in hand. Just think of all the great drummer + bass player combinations who have played together over the course of Jazz history and you'll know why. I've been very fortunate to have played with many outstanding bass players over the years and each of them have taught me, in some way or another, the meaning of swing. Probably the most definitive resource on the music of Charles Mingus out there. This book is an amazing overview of Jazz bass from both a historical and technical perspective. This is a great bass lesson but dig the great trio playing with Lewis Nash and Mulgrew Miller as well ! It's funny. Everytime I use or hear the word "killing" with reference to Jazz music I can't help but think of myself as being like one of those dorky youtube Jazz robots that have been making the rounds lately. Killing! 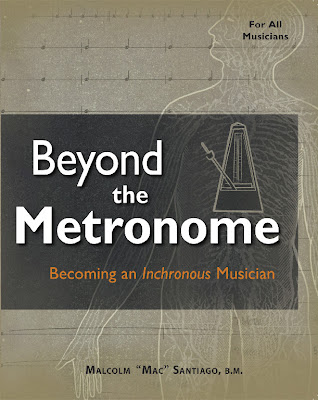 Drummer and author Malcolm "Mac" Santiago was very kind to forward me a copy of his latest book entitled "Beyond The Metronome: Becoming an Inchronus Musician". in•chro•nous (ĭnʹ krôn- s) adj. 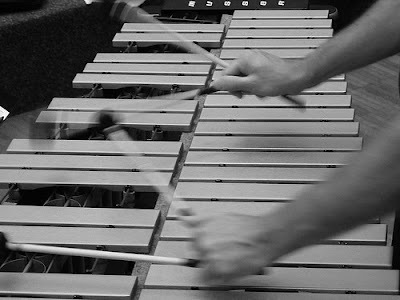 Exhibiting an ability to play rhythm accurately in steady time without the aid of a metronome, recorded music, or other musicians . . . what many experienced musicians refer to as your internal clock. Once I read his definition and introduction and understood that his book was about the topic of TIME, I was immediately interested and caught my attention. Developing a good sense and understanding of TIME should be a priority for any musician (not just drummers) of any style. Dealing with rhythm, and the issue of TIME specifically, is often accepted however how it is to be taught effectively and implemented often remains a mystery for many students and teachers of the music. Many people recognize the importance of having good TIME but when it comes to explaining how to teach that concept, many often just say "play along with a metronome" or shrug their shoulders. Well, there is obviously more to the science of musical time than simply playing along to a steady click and drummer/author Mac Santiago has developed a very interesting method and set of philosophies to help develop, specifically, a musician's "inner clock" and further one's feeling of TIME at a deeper, more personal level rather than simply being able to follow along with a click or metronome (but of course that's certainly that's part of it as well). 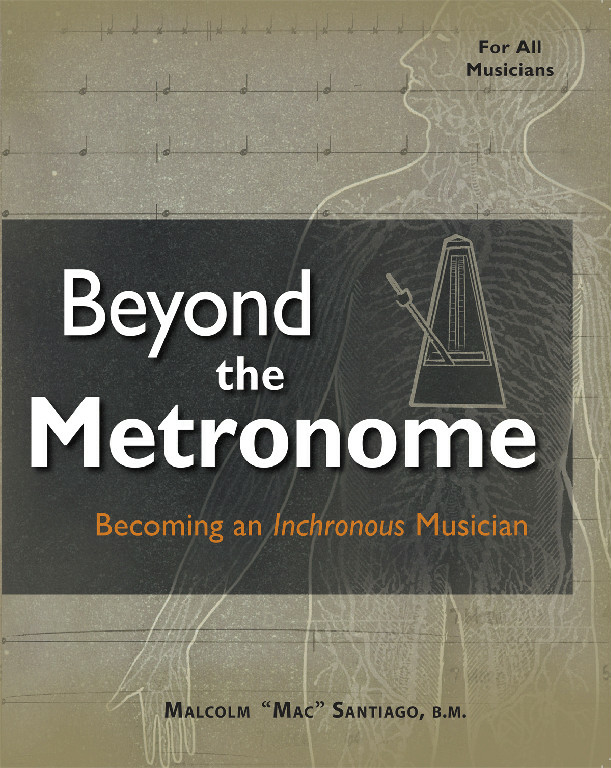 The book includes a CD containing .mp3's of various metronomic "click" exercises and routines at different tempos, all developed with the aim of improving one's sense of internal time. The overall goal of this book is to help us develop a strong personal sense of time without relying too much on external references. The author has done this by focusing on working with recorded click tracks designed to force one to rely on there own personal clock. For example, by working with "elongated" click tracks (click tracks where the subdivision gradually changes from quarter notes to half notes, to whole notes, etc.) and "diminished" tracks (where the pulse remains constant however the volume gradually decreases) one is required to shed any rhythmic insecurities one might have in order to properly execute a particular exercise and concept. Challenging stuff indeed ! The book is divided into two parts: Part One "The Tools of Inchronation" and Part Two "Concepts and Applications" and all the chapters use the extensive accompanying click track exercises contained on the CD. The first part "Tools of Inchronation" deals with what Santiago describes as "concepts and exercises to help you get a deeper understanding of what steady time feels like - recognizing it, internalizing it, and finally creating it in the manner of your choosing" and the second part "Concepts and Applications" deals with "some real-life experiences that every musician goes through when exploring rhythm and tempo". Between Santiago's well thought out explanations and philosophies of our relationship to the concepts of pulse, rhythmic subdivisions, etc. and the technical click exercises contained on the CD, this is overall an excellent resource to invest some time in if you are serious about furthering your personal relationship to TIME and rhythm. I'm quite impressed (I really dig the obvious Gene and Buddy influence in there!) 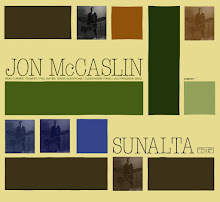 and special thanks to Clayton Cameron (a former Davis sideman) for bringing this one to my attention via the Facebook. 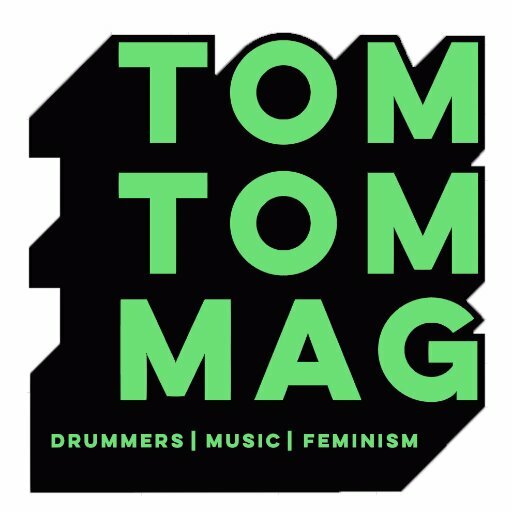 Toronto drummer/blogger Ted Warren was nice enough to interview me for his blog Trap'd over here awhile ago. I thought I would return the favor by hijacking Ted's questions and turn the tables on him this time! Ted is a true student of the music and his musicality and tireless work ethic are quite inspiring. When I lived in Toronto I always made a point of going to hear Ted play, often as a sideman with many of Toronto's finest but also with his own fine group Ted's Warren Commission. Ted is also a great composer and his overall creativity is a generous force to behold. Check out his band's albums "First Time Caller" and "Songs For Doug". I've also really been digging his playing on Michelle Gregoire's album "Reaching" lately. Ted has a solid reputation as a musical, versatile drummer. He is an active member of Canada’s jazz scene and has been recognized with Jazz Report’s Drummer of the Year award. 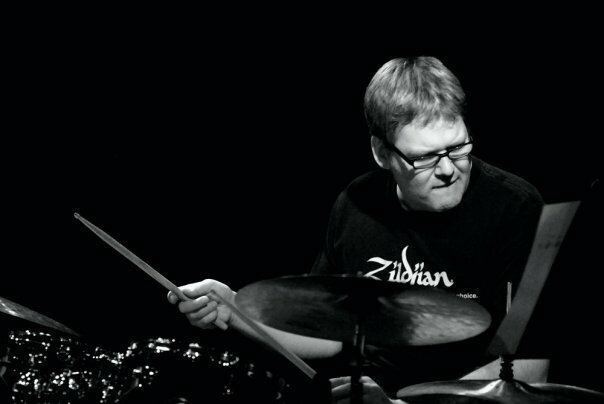 He teaches at Humber and Mohawk College in their Jazz Studies programs and is a well-regarded clinician and adjudicator. Ted fronts his own quartet, Ted’s Warren Commission, which has just released their debut CD, First Time Caller. He is a member of the Mike Murley, Mike Downes, Kieran Overs, and Ted Quinlan groups. 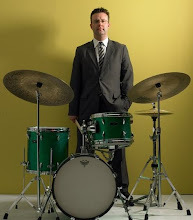 He was the drummer for the Boss Brass and can be heard on six of their recent CDs, including Velvet and Brass (with Mel Torme), From Lush to Lively (with Oliver Jones), Even Canadians get the Blues, and The Boss Brass Plays the Jazz Classics. Ted studied music at McGill and received a certificate in Jazz Studies from St. Francis Xavier University. 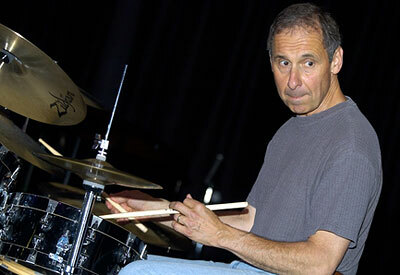 He has worked with many acclaimed performers, including Slide Hampton, Bob Newhart, Maynard Ferguson, Lew Soloff, Chuck Mangione, Jeff Healey, Norma Winstone, Howard Johnson, Nick Brignola, Kenny Wheeler, and Gerry Bergonzi. Ted’s extensive touring has taken him to Poland, South Korea, Spain, Brazil, Iceland, and Japan. He has also performed at Carnegie Hall with harpist Joanna Jordon. In addition to his other recorded work, you can hear Ted on Mike Murley’s CDs Extra Time, and the Jazz Report’s Album of the Year recipient, Conversation Piece. You can also hear Ted on the Juno Award winning Tales from the Blue Lounge by Richard Underhill. Ted endorses Vic Firth drumsticks and Zildjian cymbals. 1) As well as working frequently as a sideman, you also lead bands and compose for them. What do you think other instrumentalists can learn about these disciplines from drummers? I feel drummers are very concerned with the mood and shape of music, and how the tempo and feel of a piece affects it's mood and shape. I think often other instrumentalists can be overly concerned with other aspects of music (harmony is one frequently occurring example) and might miss the fact, for instance, that most of the tunes they play are the same tempo. 2) Can you name a recording that was particularly influential to you? I still can remember the first time I heard Miles Davis' "Seven Steps To Heaven" with Tony Williams on drums. I was in 9th grade and a friend played it for me when we were hanging around in his basement one day after school. Even though I didn't have a clue what they were doing I thought to myself, "What a cool tune!" and " What a REALLY COOL drum solo!" 3) Can you name a profound live performance? There have been many. I have been fortunate to see some great musicians who are no longer with us (Mel Lewis, Dannie Richmond, Dewey Redman, Max Roach,Tony Williams, Vernel Fournier, Elvin, Junior Cook, Ray Brown). I have also gotten to see Keith Jarrett, Jack DeJohnette, and David Liebman quite a few times, which had been very inspiring. I think for me, every time I've seen Bill Hart play is important to mention, because he always gives me the feeling that something special, profound, and unique is happening. I'm striving to give people that same sense when I play. 4) What are your current goals in drumming, teaching, and music? I plan to keep working and practicing at many aspects of music. As well as drums, I have been working at playing piano and harmonica, which has completely widened my perspective on music. ( We've got to get that band together of all-drummers-playing-different-instruments Jon!) My trio with Rich Brown and Mike Murley is releasing it's debut recording soon, and we're doing a tour in March. I'm almost finished my Bachelors in music. I plan to keep teaching, both privately and in institutions, as much as I can and keep doing lots of clinics. All that should keep me out of trouble for awhile! 5) Has your blog changed your approach to playing or teaching? 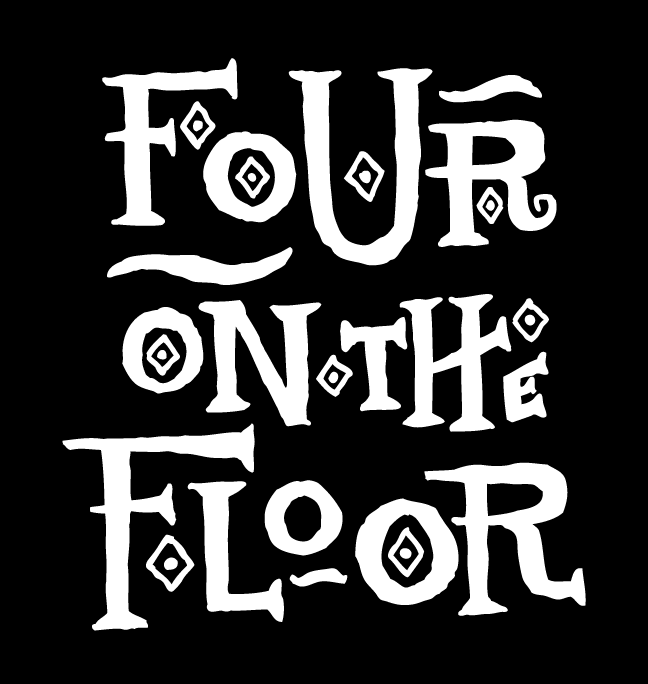 I initially started the blog at my wife's suggestion and didn't really know what to do with it until I started reading "Four on the Floor" and some other peer's blogs. I then figured out the tone, format and content that would be appropriate for me. It's changed my teaching in that on the blog I can put out anything I feel is important without having to answer to anyone else and I can often get into greater depth than is possible in a lesson or a clinic. The blog has changed my approach to playing in that now a lot of my exchange of ideas and thoughts with other drummers happens online. I rarely am on a gig with other drummers, we all have busy lives and careers etc, and often there are great geographical distances between us. It's interesting, because several years ago Dennis Mackrel mentioned he thought the net was the new "hang" for musicians. That's certainly been the case for me. 6) Why is everyone from Regina, Saskatchewan obsessed with football and pizza? It's a puzzling question. I always find it a little sad how uninterested Central Canadians are in the CFL. As far as pizza goes, I've never found anything that compares to Regina anywhere else in the world. Houston Pizza (circa 80s anyway) rules, by the way! Dig the moment around 4:43 where Mel busts into an uptempo swing groove. Yeah! -I hit the Broken City Jam session on Saturday afternoon (keeping in my mind my previous two posts of jam session etiquette, of course!!!) and was treated to Edmonton's Jerrold Dubyk on tenor and Bill George on drums joined by my frequent Calgary comrades Rubim DeToledo on bass and Ralf Buschmeyer on guitar. Fine playing, as always, from all and Jim Brenan (tenor) and I sat in for a few numbers including a spirited, up tempo tenor battle on a rhythm changes. It was also nice to see such a large crowd come out (although not that many musicians this week?) to support Calgary's premier and longest running jam session. This is a well run session and an important part of the local scene. Make sure to support your local jam session wherever you are. -I stopped by Bob Everett's vintage drum shop BEAT IT in Calgary last week and marveled at his large collection of vintage Ludwig drum sets. If you are looking for a nice sounding, vintage Ludwig chrome-over-brass Superphonic snare drum, Bob is definitely the guy you should talk to. He also had a set of thin 13" K.Zildjian hihats from the 1930s that sounded very nice. I played around with them and made a few interesting observations: They were really quite quiet when I played them with my left foot (2&4) no matter how hard I stomped on them (!) However, when I played them with my sticks (a la Jo Jones) they totally had that sound and feel that I would associate with the style of 1930s big band drumming. What really surprised me was how bright these hihats were but the more I thought about it, it really made sense. Of course drummers didn't really play 2 & 4 with their hihats back then, but the brighter sound when played with sticks would allow them to really cut through a full brass and horn section. I haven't played many old K.Zildjian hihats so this was a bit of a revelation for me. 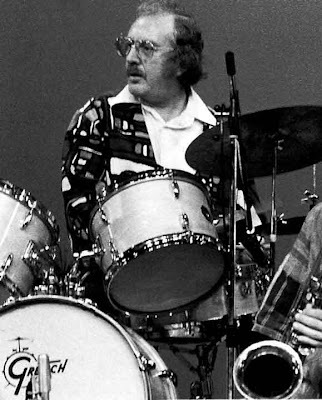 I was fortunate to study and work with Joe at the Banff Centre for the Arts during the summer of 1997 and it's always a lesson in itself to check out his loose and flowing technique around the drums. I've actually been meaning to check out his album "Mark Time" as a leader for some time now. 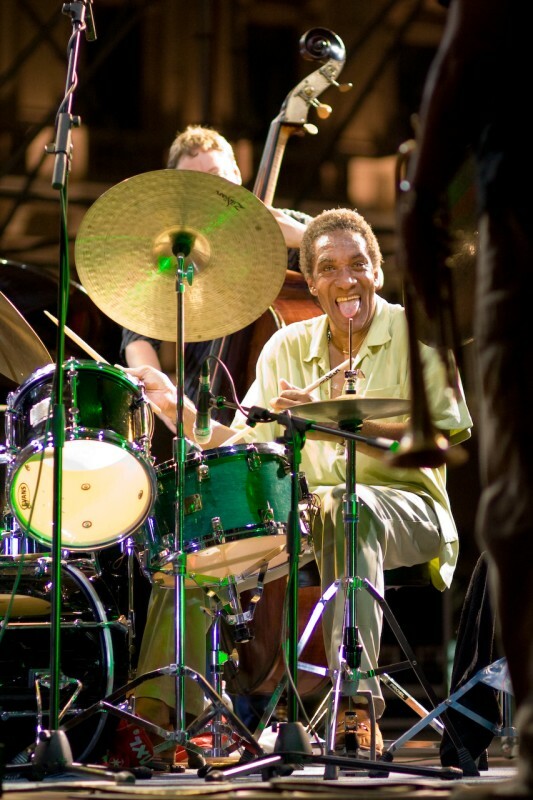 Oh yes, today is Max Roach's birthday. 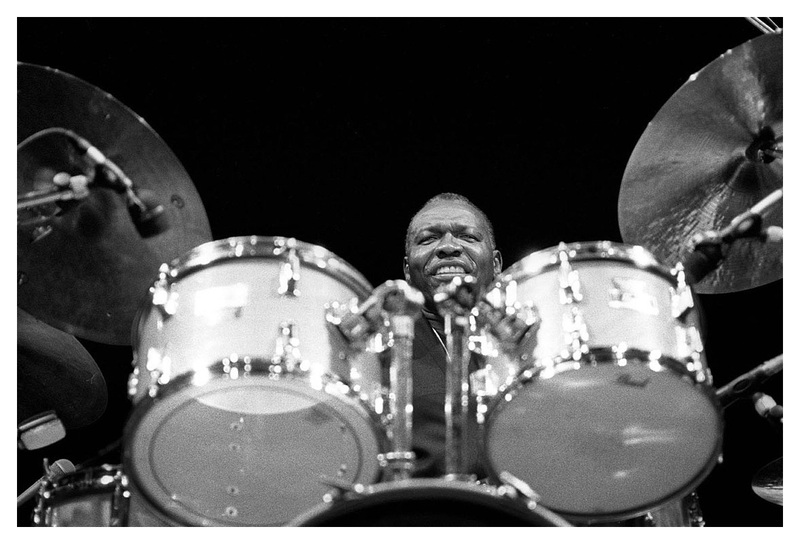 Today I'm going to explore a few variations on a classic Elvin Jones phrase. I had the opportunity to play with Dave Liebman during a masterclass at McGill University many years ago and he pointed out (keep in mind here that Liebman is also himself a great drummer!) that Elvin would often play this phrase with the bass drum on the second beat instead of the third. Furthermore, divide your hands around the drum set and vary the tempo as before and you'll come up with some creative variations. *Also, try substituting the hihat instead of the bass drum or mix it up between the two feet to further explore variations of these patterns. 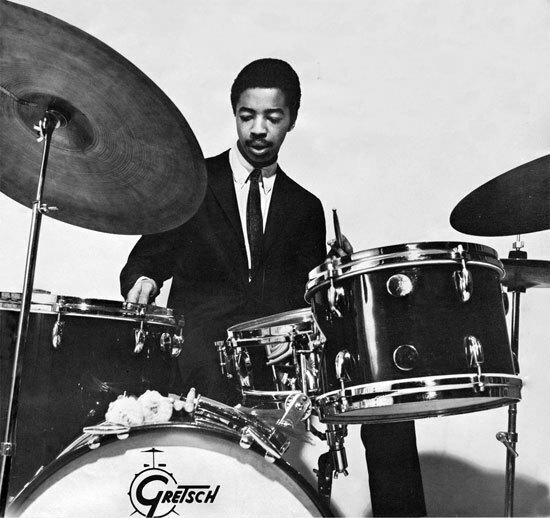 Dig the Tony Williams black dots on the drumheads. Nice! Clearly I touched a nerve with my last post. 25. Don't call a tune that you don't actually have a clue how to play. 26. If you don't know a tune; don't suggest that you'll play it from ear when you actually cannot play by ear. 27. If you don't know a tune; don't suggest that you'll read the chart when you have no idea how to read or transpose music at sight. 28. When you get lost in the changes and eventually stop soloing 10 measures short, don't look at the bass player to some how fix your awkward silence. 29. After a bass solo, play the melody out. If you're not paying attention to the form and forget to come in; don't ask the bassist if they are done soloing 10 bars into the form when it's clear that they where finished 10 bars ago. 30. When playing a really really really fast tune don't ask the bass player to play a solo, they are to busy playing bass. 31. Having a conversion on the band stand during the bass solo isn't a good idea, especially if the leader is the bass player. 32. Call Jazz tunes at a Jazz Jam session, not pop, rock, r&b, rap, space age funk or any combination thereof and expect anyone to know them. 33. If you play a horn please do not accompany behind the bass solo. If you are in the rhythm section you don’t always have to play behind the bass solo. 34. When calling a really obscure tune and the rhythm section admits to not knowing the changes; don’t reply with “Really you don’t know that tune?” Beware, the tables can turn on you in a hurry. "It is also the height of lame for a jammer to play a tune and then leave the venue right away. It is polite to hang out, even for a little while, to listen to a few other players and generally contribute to a good vibe of a jam session." 1. Don't be a solo hog. Say what you have to say in as few choruses as possible. 2. Don't cut another soloist off by jumping in. 3. If you don't know the tune, don't solo. Nobody wants to hear a person who hasn't paid their dues on their horn make a complete fool of himself by trying to make every one think he knows how to play. 4. Don't tell the leader what to do. It's their Jam. Not yours. You can always get your own jam someday. 5. Know when to play. 6. Know when to sit down and chill out and enjoy the other players. 7. Have respect for the other soloists ideas by not doodling' around on your ax when they are playing. 8. If the other players start to riff behind the soloist, then go ahead and join in, but remember the balance, don't cover the soloist up. 9. Remember the solo order so when fours come up, everybody gets a turn. 10. The Bass doesn't need a solo on every tune. 11. If there is more than one horn present don't all play the melody in unison. Use different harmony parts and chord tones to create interest. 12. When playing a Ballad, split up the choruses in half, so the tune isn't an hour long. 13. Don't insist on staying up on stage all night. Play your 3 or 4 songs and make room for the other soloists who haven't played yet. 14. Never be critical of another person on the bandstand. If you have something to say to someone about their pitch, tone, sense of time, or what ever, wait until the break. 15. Never be a mike hog. Always share. 16. Don't call tunes in order to impress somebody. No one wants to hear Carla Bley Tunes with no Bar Lines performed at the speed of Cherokee. Or Anthony Braxton tunes performed with a polka feel. 17. Learn some tunes that you love, and do them. 18. Don't judge other people's tunes. If you hate the song Stella by Starlight, instead of complaining about it, go sit down and take a break. 19. As a horn player, when the singer sings don't play. It's ok to fill in between their phrases as long as it's done tastefully. 20. Use space. Don't play every Jamie Abersold lick that you know in the first three minutes. Save some ideas for later. 21. Be Mature. A jam is supposed to be about mutual respect for all the players regardless of ability, and not just a cutting contest. There is no room for "Higher, louder, faster," types of players who want to show off. 22. If the person ahead of you just took 8 choruses on the blues, don't try to "better" him by playing more if you have nothing to say. 23. Play in tune with each other. Don't have the attitude that "I'm right, Everyone else is Flat". 24. When ending a tune, look to the Bass or piano player for signs as to which type of ending will be used. Is it the 3 times a charm ending? Or that everybody stops at the same time with tight cut off ending? Is the rhythm section going to put a turn around at the end and vamp for a while ending? Turn on your radar. Happy New Year everyone. I hope you all had nice holiday in your respective parts of the world. I had a very nice break over the past few weeks but still found time to practice, play a few gigs and check out a few interesting things while enjoying the holiday break with my family. -Saxophonist (and recent NEA Jazz Master recipient) Dave Liebman is truly a master jazz musician and I always enjoy reading his perspectives on music. -Interested in checking out some crazy tunes ? 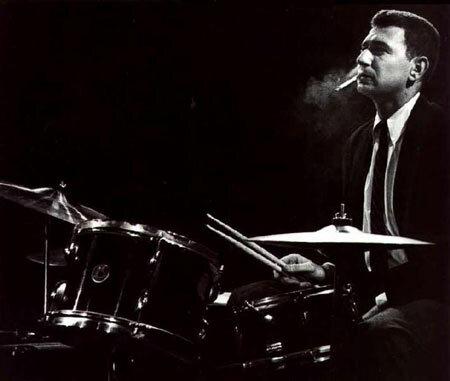 I can highly recommend Herbie Nichols: The Unpublished Works by Roswell Rudd. Pianist Frank Kimbrough hipped me to this great resource/fake book and insight into one of Jazz music's forgotten geniuses a few years ago while I was doing some research about Nichols at the University of Toronto. Well almost forgotten...Canadian Jazz writer Mark Miller has also written an excellent biographical tome about the life of Herbie Nichols entitled Herbie Nichols: A Jazzist's Life Both are worth checking out and offer a glimpse into a genius that fame and recognition, for the most part, managed to pass by. However, thanks to people like Rudd, Miller and Kimbrough (and Ben Allison and the rest of the Jazz Composers Collective crew that recorded Nichol's unique compositions) we can learn from Herbie Nichol's brilliant compositions and musical legacy. 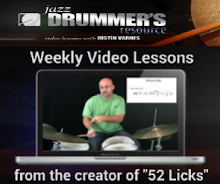 -Looking for another interesting drum method to add to your collection? I've been getting a lot of use from George Marsh's unique drum method entitled "Inner Drumming" lately. This is a very unique approach to movement and coordination on the drum set that incorporates elements of Tai Chi and a unique method of notating physical movement around the drums (using boxes and arrows). George was very nice to send me a copy of his book awhile ago and it has certainly opened my eyes and ears to how I physically move around the drums. 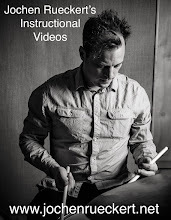 Matt Wilson also alluded to George's method and how to develop a sense of physical "flow" on the drum set when I studied with him several years ago. George sent a couple copies of two of his album's entitled "Game, No Game" and "Yes And" that feature him in various improvisations with a couple of different pianists. You can learn more about George, his method and his music here. Whether you like his music or not, it's hard to not to appreciate his passion for the music. Personally, I dig the man and his music.